Kids spend an average of 6.5 hours in front of screens every day *! This phenomenon results in few negative effects such as social disconnection, development delay and obesity. 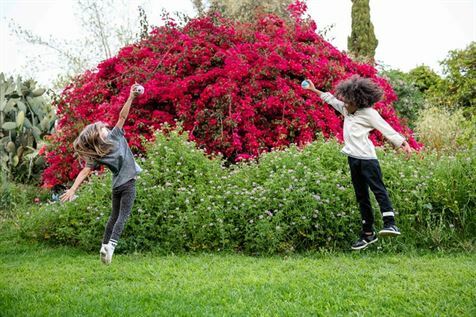 One of the biggest challenges parents face in recent years is how to get children to put the screens aside and play away from them. In the world of tablets, smartphones, playstations and computer screens, the games we remember from our childhoods, dolls, balls and sports games, seem to unable to compete and become attractive alternatives to screens and applications. The "stupid" products do not upgrade and update, they are uninteractive, and kids cannot share the experience using them. Thus, a large proportion of the children of the world grow up when they are clinged to screens and do not physically move or use the full potential of their imagination. The percentage of obese children are constantly on the rise, and in the United States, each of five children is overweight (U.S. National Library of Medicine). 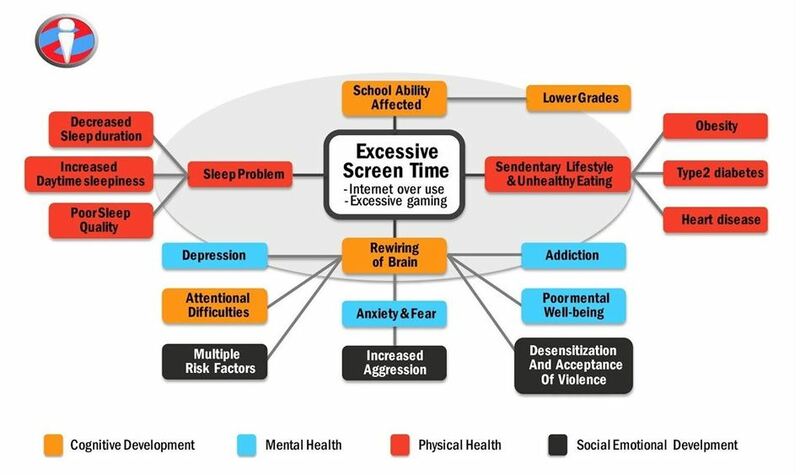 The seek for screen alternatives keep growing together with the growing awareness of screens harms and their critical influence on normal development of kids. 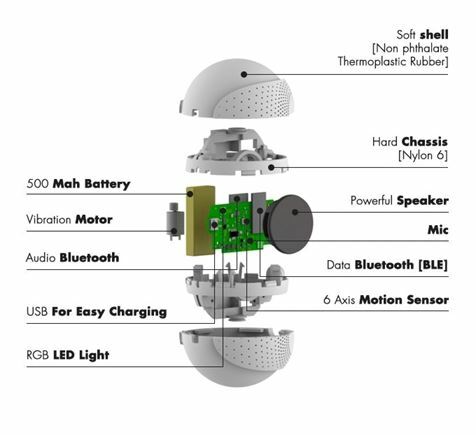 By introducing smart sensor-based technology into a familiar physical product, Storyball bridges between the physical and digital worlds and create a new form of game detached from the screens that encourages children to be physically active and helps them develop important skills such as coordination, precision, musical hearing and problem solving. The children play a smart game that “learns” them, develops and improves according to their needs and provides them with a positive, educational and personal experience. The "Internet of Things" (the IoT revolution) realized at Storyball is a global trend that has changed the way we experience and use products in different areas in our lives. The combination of technology in the world of games and toys is a major breakthrough in the traditional and classic toy world. The different characters allow variety and each skin is actually a completely different character with a separate "personality", different voice and a separate play world. Storyball talks to the children using the built-in speaker and urges them into active roll and movements they need to perform in order to make progress in the story. Storyball can identify whether actions were performed and in which way and reacts accordingly. The stories and actions required vary according to the different characters, the level of difficulty increases and more abilities open up as the user plays more. 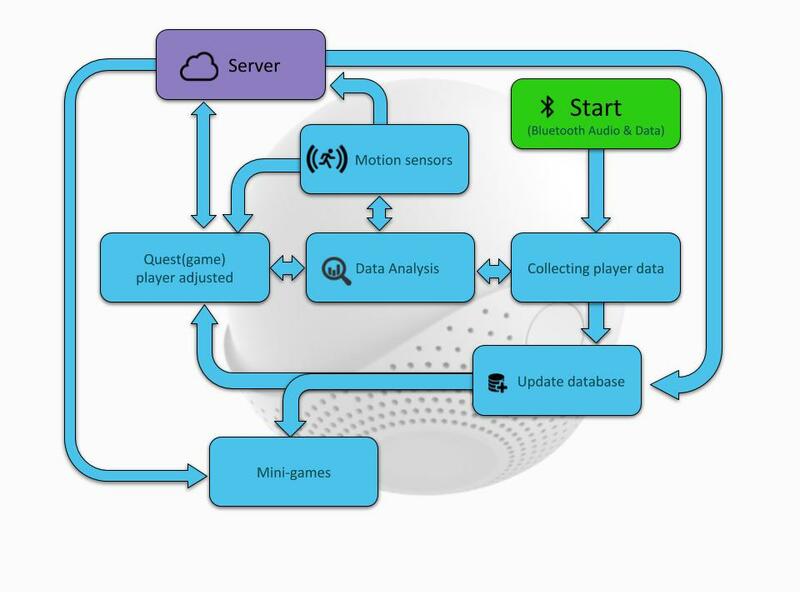 • The game console - a motion sensor base unit and a unique algorithm developed by one of the company's founders; an algorithm expert with experience in programming sensors for unmanned aircraft. A design patent was submitted for the console design. • Skin – Skin is the replaceable character attached on the ball and brings with it the personality, form of play and content. Each character contains a vast IP that is expressed in unique content, voice and sounds. 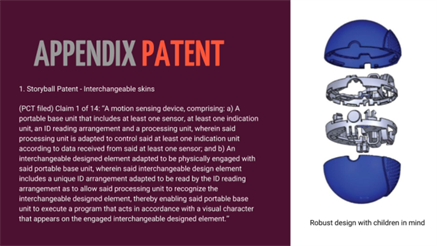 A patent was submitted in 2016 in Israel for the connection between the skin and the console, followed by a PCT submission in the US by Luzzatto & Luzzatto, in advanced stages of approval. • Application - The application determines the course of the game, the conduct of the console and the data collected. The application is a unique IP of the company and allow users to learn the game while using AI and its implementation in the game. Content - The integrated content in Storyball is original content written and owned by the company. Content is implemented to the console using dedicated editing software developed by the company that will in next stages be open for other users to write content to the ball. The goal is to enable the writing of basic content for children, as well as advanced editing for professional content writers and professionals (teachers, therapists, etc.). After completing his master‘s degree in law and internship in the Central District Attorney‘s Office, Chen realized that his passion is elsewhere. The entrepreneurship has always been in his blood, and at the age of 15 Chen set up his first business in the field of Magic, which he developed into a successful and profitable business. 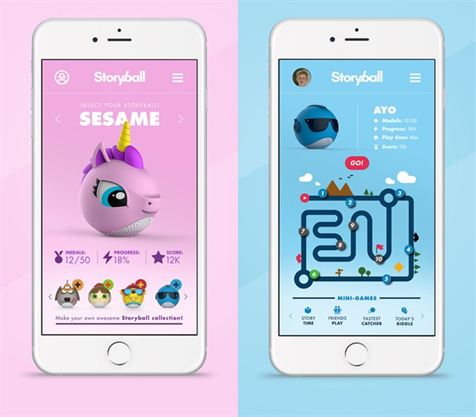 The children‘s world and entrepreneurship naturally combined and together with two childhood friends, Meir Biton and Yuval Lombrozo developed an innovative platform, Storyball. Chen served in the IDF in an Elite Unit as a combat soldier, deputy commander of a team and a combat instructor. 34 years old. Married to Neama and father to Tomer and Amit. Co-Founder. Yuval is a Mechanical Engineer (Technion, com laude) with significant experience in the field of multidisciplinary development. In the past, he conducted projects in robotics and automation, and developed algorithms for control and guidance systems for airborne systems. Yuval is the technological leader of Storyball and is responsible for synchronizing all product development disciplines: software, hardware, mechanics, connectivity and more. Yuval served in the IDF as a combat soldier in one of the Navy’s elite units. 34 years old Married to Hamutal, father to Hagar and Adam Co-Founder. Meir is a designer, a graduate of Bezalel Academy of Visual Communication. Editor for Video and UX/UI designer. Meir is the creativity and inspiration leader of Storyball, already drawing and shaping the vision of the next generation. Meir served In the IDF as an officer and commander. 34 years old. Co-Founder. Adi has over 20 years of experience in the field of product development and marketing consumer products. She managed the product development at Tinylove, a leading brand in the field of developmental toys for babies. Adi‘s extensive experience in a variety of industries helps Storyball build the company‘s infrastructure correctly and prepare for scaling and expansion into markets. 46 years old. Married to Tal and mother Yuval, Yael and Noa. Partner and employee at the company. Giora joined the team in early stages and is responsible for developing the device software and mobile application.Giora brings with him experience in software development in various programming languages, leading the software field in the company. He previously worked for Mellanox and Matific. 33 years old. Married to Roni and father to Yuval. Senior Partner and Software Manager. Yuval has joined the company recently and already contributes with his rich experience in the field of game design. He holds a BA in industrial design and has a wide range of experience in different design fields ranging from exhibitions, furniture, lighting and more. In the past, Yuval had been a partner in a Gaming start-up and managed the UX/UI. 46 years old. Married to Tami and father to three daughters. Employee. Storyball is proud to be honorably mentioned in The 2019 KAPI Awards for innovation in Children media by CES, The largest annual technology conference for the consumer electronics industry. The Awards celebrates excellence in children’s media and digital toys. Storyball recently announced as the winner of the PitchEd competition, Livepitch in front of an audience of Education, Media & publishing executives at the EdTech Conference, supported by Ed-Tech Exchange & BESA. Cash Prize money & PR.